Most people know the story of Private Wojtek, the beer-drinking, cigarette-smoking Soldier Bear of World War II. Orphaned as a cub and rescued by Polish soldiers, Wojtek was raised by the 22nd Artillery Supply Company while on campaign and became famous for his incredible strength, docile nature, and hilariously anthropomorphic antics. A 13th-century castle covered in a gigantic graffiti mural. Today, statues of Wojtek can be found all over the world, such as in Edinburgh, Krakow, even in Italy, where Wojtek’s famed talent for dangerous heavy lifting was first discovered. 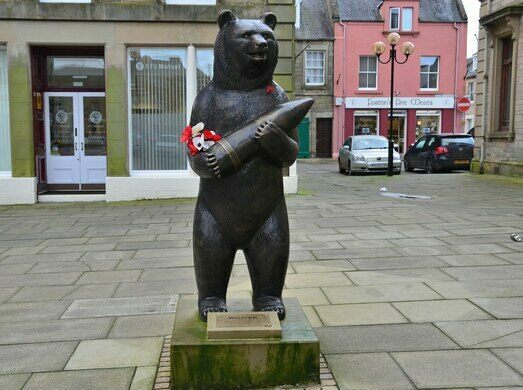 One place you wouldn’t expect to find a statue of him is in the rural Scottish Borders, yet surprisingly it’s the perfect place to erect a tribute to the beloved Soldier Bear. 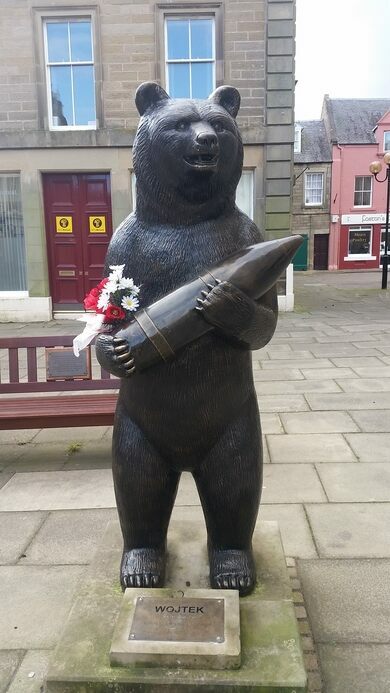 At the end of WWII, before retiring to the Edinburgh Zoo, Wojtek and the rest of the 22nd Company were re-stationed at Winfield, an airfield in the Scottish Borders about 10 miles outside of Duns, the largest town in the surrounding area. Although his days of active duty were over, Wojtek was still a major draw for the media and local residents alike; so adored was he that the Polish-Scottish Association made him an honorary member. Duns’ statue was unveiled in 2016. In attendance were the Mayor of Zagan, Poland—twinned with the town of Duns—and a Polish priest, who blessed the statue. It depicts Private Wojtek in action, doing what he did best: lifting a heavy artillery shell with great ease. 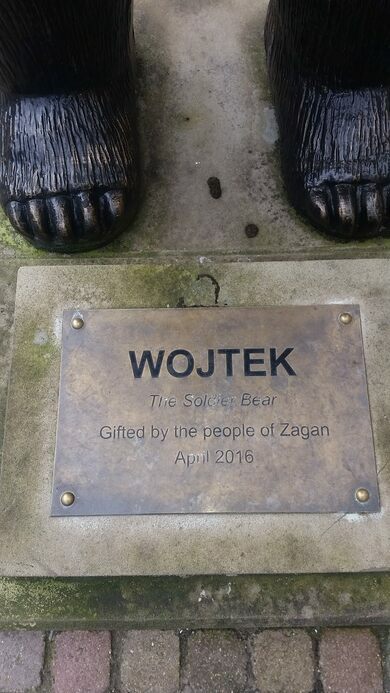 The Wojtek statue is located in the Duns Market Square, in front of NFU Mutual.